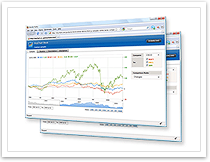 This Rich Internet Application shows how AnyChart Stock component can be used to create stock market analysis system. This sample application provides the ability to use technical indicators built-in to the component to analyze of one sample stock. Besides these technical analysis options, there is an option to compare different companies stock quotations using "Compare To" menu. For the ease of data representation and handling user has abilities to change series display type, switch between logarithmic and linear axis scales and display significant events on the plot. 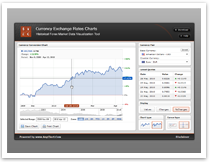 This sample Rich Internet Application demonstrates incredible capabilities of AnyChart Stock Component for currency exchange rates visualization. User can choose currency pair and view historical exchange rates, which can be displayed either in absolute values or in a form of changes. Four different chart types along with some other visualization settings are available. Also there is a custom table control to display latest quotes information. Application uses AJAX data loading techniques to allow smooth data loading without significant delays. 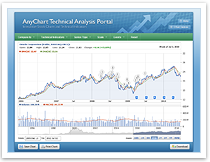 This sample demonstrates full set of AnyChart Stock Drawing tools that can be used for Technical Analysis. User can draw Trend lines, Rays, Lines, Triangles, Ellipses, Rectangles, Trend Channels, Andrew's Pitchfork, Fibonacci Retracement, Fibonacci Arcs, Fibonacci Fans, put Buy/Sell Signals and Custom Text Labels to the chart. Full editing, coloring and line style tuning is also available. One of the most amazing AnyStock Demos is just a click away from you. Each sample comes with an annotated source code, description and ability to download sample files for use or study. This collection is the "must see" place for the developers, who want to use our component in the Web applications. 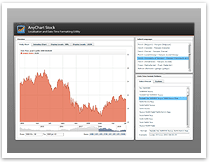 This utility is a very handy tool for the developers, who need to create localized charts and, at the same time, a nice demo of AnyChart Stock Localization options. You can choose any preset (language) and obtain localization configuration for use in your charts or application in XML or JSON format. There are 130 presets available and they cover most of the regions on the Earth! 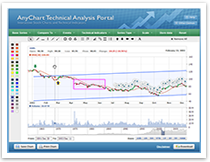 This Rich Internet Application shows how AnyChart Stock component can be used to create stock market analysis system with ability to draw annotations and save changes in a browser localStorage (also known as the Web Storage). This sample application provides the ability to use technical indicators, comparison mode, scale settings, display type, axes settings, event markers and almost all other major AnyStock features. All the changes made by user can be saved in the Web Storage (if browser supports it) and they are displayed when on the next page visit.